This large, 16 1/2 inch Presentation Dagger has engraved Buds and Roses encompassing the huge pommel. A Fossilized Walrus handle has braided-silver wires flowing down the handle. Now for the guard â€” it is something, with Rose engravings, Rose Vines, Rose Buds, and Gold inlayed sculpted Roses on both sides of the guard. The double hollow ground blade is perfection in craftsmanship. I wonder which king it was presented to. 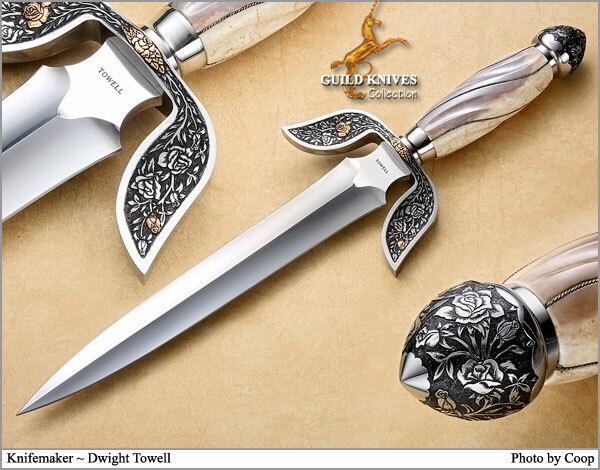 Towell is one of only 25 makers in the world who presents his knives at the Art Knife Invitational show every other year. Warranty : By maker for their lifetime.